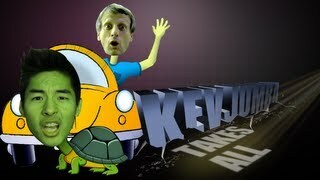 Kevjumba Takes on Tony Hawk at K1 Speed! Episode 6 – KEVJUMBA challenges pro skater and legend Tony Hawk to go kart racing at K1 Speed Carlsbad with extra rules. Watch and see who has the advantage on these four wheels. YOMYOMF Network’s new comedy webseries “KEVJUMBA TAKES ALL” where YouTube sensation KevJumba fearlessly duels celebrities in difficult, wacky, and hilarious competitions. Stay up to date on shows and events on our Twitter, Facebook and Blog!